I am excited to share a fun opportunity with you! 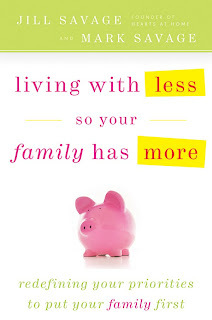 To celebrate the release of Hearts at Home’s newest book: Living With Less So Your Family Has More, by Jill and Mark Savage, the Hearts at Home blog is launching the Living with Less Contest. Email Hearts at Home a story or money-saving tip that gives a peek into your daily experiences representing the humor, richness, or spiritual aspects of what it’s like to live with less. Better yet, blog readers will benefit as many of the money-saving entries will be posted on the Heart’s blog throughout the month of February! For contest details go here! That's a great contest. I especially love the name of the book - it's pretty eye-catching.